This octagonal summerhouse is an attractive addition to any garden. Available in 8ft x 8ft and 10ft x 10ft models, both feature a half-glazed joinery door with antique hinges, lever lock and ornate handle. It also comes with two fully glazed top-hung windows and two fixed windows. These side panels can be moved around to suit your design requirements upon installation. 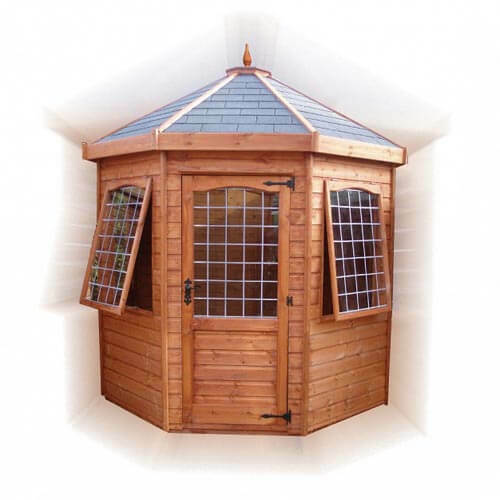 This attractive summerhouse is a great addition to any medium or large garden and has a choice of glazing options and extras to make it suit your garden perfectly. For more information about this summerhouse or any of the other buildings available from GSG Buildings, feel free to get in touch with us today.